myParish is a premium Catholic parish app that helps improve parish communication and outreach while offering the features that parishioners enjoy in a good app. I like having mass times at my fingertips. I also like having the list of prayers. And the best part of all is I can set a reminder for some of my prayers. This is an app for everyone. 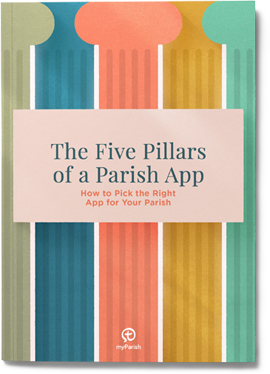 If your parish isn’t registered to use this app, you need to recommend it to your pastor. It is a wonderful tool to stay in closer contact and connected to your parish and its functions. It keeps all of my family up to date on what’s going on in our Parish. We check Mass times and even keep track of our last confession. It even has the news from a Catholic perspective…refreshing. Amazing new design. This app has everything. 5 stars!!! Easy to use with many features at your fingertips. Glad my parish is using this now. How do I sign my parish up? From your Apple or Android device select your app store below. Then during initial launch enable location services and select a parish near you.